Recent eruptive activity at Nyamulagira: Now, there is a lava lake! As previously reported, intermittent lava fountains appeared on top of Nyamulagira volcano since April 2014. These lava fountains, first erroneously interpreted as a lava lake by NASA in June 2014 , were observed for the first time in the field in July 2014 by a team of Congolese, Belgian, Luxembourgish and Italian scientists . Around mid-September, this activity stopped, but reappeared in early November as a small bubbling lava lake, at the same location as the lava fountains observed in July (see the previous news article for location details). It is uncertain if this activity will persist or not. If the current activity is similar to what occurred between 1913 and 1938 at that volcano, we will probably have intermittent activity that may progressively give birth to a long-lived active lava lake, as it is the case at the neighbouring Nyiragongo volcano. Our article on the recent eruptive activity at Nyamulagira has recently been published this week, in EOS Transactions. Click on the picture below to access the paper! Recent eruptive activity at Nyamulagira: there is currently NO LAVA LAKE. Sporadically from April 2014, then more systematically since 22nd June 2014, a red glow has become visible on top of Nyamulagira (or Nyamuragira), the most western volcano of the Virunga Volcanic Province. On 1st and 5th July 2014, helicopter flights confirmed the presence of lava fountains in the 400 × 600 m-wide pit crater located in the NE sector of the caldera. Unfortunately, this misleading information was quickly relayed on several websites (e.g.  ) and even in scientific literature , as it is often the case for this volcano and the neighbouring Nyiragongo. More (correct) information about this activity has been published in EOS Transactions. In addition, images of this activity, which were acquired in early July 2014 by N. d’Oreye, F. Kervyn and me during helicopter flights and field work in the Nyamulagira caldera, are available here (Click on the image below). Benny is in the newspaper, today! [EN] Today, 23rd July 2014, a whole page of the newspaper « La Meuse » has been dedicated to my recent field mission on Nyamulagira during which we observed new eruptive activity in the central caldera of the volcano. Click on the image below to see the full article (in French). [FR] Aujourd’hui, le 23 juillet 2014, une page entière du journal « La Meuse » a été dédié à ma récente mission de terrain sur le Nyamulagira, durant laquelle nous avons observé une nouvelle activité éruptive dans la caldera centrale du volcan. Cliquez sur l’image ci-dessous pour voir l’article complet. 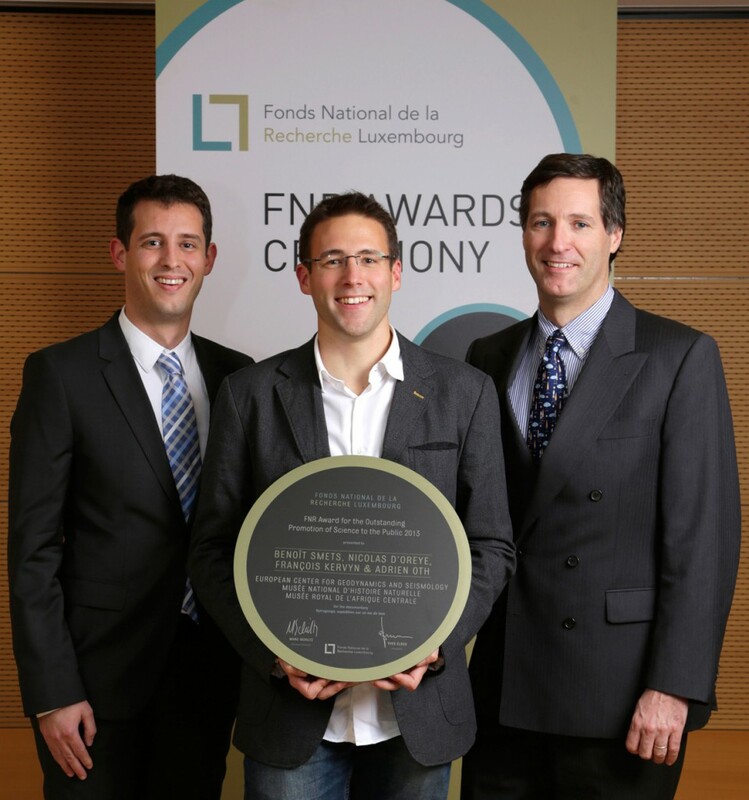 In October 2013, Benoît Smets, Nicolas d’Oreye, François Kervyn and Adrien Oth have received the FNR Award for the Oustanding Promotion of Science to the Public, thanks to the documentary « Nyiragongo, expédition sur un lac de lave » realized by B. Luypaert for the Belgian Public television, and for the public conferences organized by the scientists in both Belgium and Luxembourg. From left to right: Adrien Oth, Benoît Smets, Nicolas d’Oreye. More information about the FNR Awards here.